In the latest move in the tale of the dueling countdown clocks, the White House has stepped up their message to target the House and Speaker John Boehner. 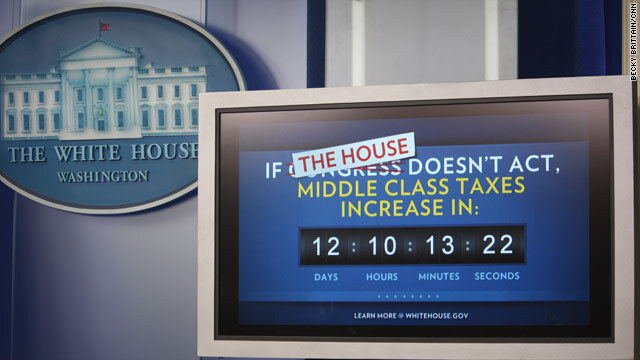 The running countdown clock, which has been displayed in the White House Briefing Room for the past couple weeks, now says "If the House doesn't act, middle class taxes increase in..." rather than calling on all of Congress to act. House Speaker Boehner also put a countdown clock on is official website last week, with the word "Congress" marked out and calling on the Senate to act. The battling clocks are both in reference to the vote in the House for an extension of payroll tax cuts and unemployment benefits. Speaker Boehner has said that he rejects the Senate plan for a two-month extension and thinks the House should work through the holidays to reach a new compromise. THESE POLITICIANS ARE CLOWNS.... THEY ARE PLAYING WITH THE COUNTRY... ACT LIKE ADULTS AND STOP PLAYING AROUND LIKE CHILDREN FOR GOD'S SAKE!!!!!!!!!!!!!!!!!!!!!!!!!!!!!!!!!!!! I was just surfing the web and found this! Libs,,, Check it out and laugh at IT as much as you will laugh at me as an Alinsky Dribbler! I just love the Internet where all is saved and nothing is scrubbed! I want to hear the Libs with GREAT MEGA-PHONES now! or we can use the MSNBC Shout-out! If this clock is not designed to cause fear ... I don't know what is... Sorta like the doomsday clock.... don't Ya Think? A 2 month extension (according to government estimates) will save me only $160. Those clocks cost more than that! Whatta Joke–just like the new twitter feed–all propaganda all the time. House puts together a bill that would have settled the matter for a year, the Senate throws a half-arsed 2 month band-aid and runs off. Then the WH has the tenacity to change it's propoganda from "Congress" to "The House"? One and all, your head in the sand that Dem's are non-complicit in undermining you. They cannot wait to make you slaves to the gov't. Two problems. Working through the holidays and a compromise. I hope that they work it all out before time runs out at the house. Then they are left with very few choises.